Sign-up to Treatwell Newsletter for Exclusive Discounts! Where do I use my Treatwell voucher code? Find a code you would like to use at NetVoucherCodes and copy the code and follow our link to the Treatwell website. Browse for your treatments, choose your times and add to your basket as normal. Click ‘go to checkout’ when ready to proceed. Enter your promo code into the box underneath your card details and click ‘add code’. Your order total will be updated, click ‘checkout now’ to complete your order. Treatwell are the health, beauty and wellness marketplace, with great deals on everything from spa breaks, salon appointments and massage sessions to hair makeovers, facials and manicures. 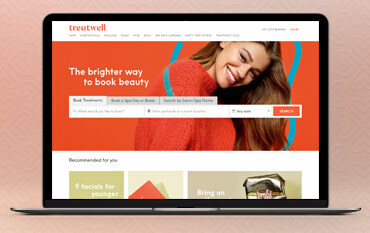 Treatwell, previously known as Wahanda, is the largest hair and beauty bookings website in Europe. The company is made up of 500 people working throughout Europe with over 20,000 local partners creating a 24/7 beauty bookings platform that puts customers and salon managers in control, lets you book at times and prices that suit you, and that gives you all the style know-how you need to look and feel amazing. As well as beauty bookings Treatwell also offers spa days and breaks. With the former Wahanda Spa now gone, Treatwell is the new and improved site offering 401 venues and a fantastic range of 1,760 Spa days. Indulge your body, soul and spirit with days at the spas you love. Countryside or metropolitan, single hit treatments or day-long packages, they’re all yours. Gift it, share it or revel in your own sensually satisfying day out for one. Just like Wahanda London, Treatwell offers a range of superb salons across London where you can enjoy spa breaks and treatments. Get hair removal treatments, cleanse your face, body and skin, indulge in a massage or get your nails or hair done. Pick the perfect salon in the ideal location in London and book now for a great price. If you need to cancel an appointment at one of the Treatwell outlets, you will first need to check that you're eligible to amend or cancel your booking. You can find this information in the Treatwell Refund and Cancellation Policy. Once Treatwell has processed your request, they will then either reschedule your appointment, transfer your booking or issue you with a credit note so that you can use it to purchase an alternative offer. You can also contact the customer care team for any further assistance regarding cancellations & amendments. See contact below. Each and every one of the Treatwell venues are very popular and thus extremely busy during all hours of the day. If you're struggling to get in touch with your local treatwell, you can always attempt to contact them via email. Failing this, if you email the help team at help@treatwell.co.uk and supply your order reference number, name, 3 preferred dates & times, venue and your contact number, Treatwell will forward your details onto your desired spa/salon with a request for them to confirm with you as soon as possible. For more answers to Frequently Asked Questions, see here. Find a Treatwell Spa or Salon near you using the online search tool. Treatwell was established back in 2008 in London around a dining room table. Since then Treatwell has been on a mission to inspire people to express their beauty in every way. They believe that there is a better way to find and book your hair and beauty services, which they can provide. They also aim to supply customers with more choices and the confidence to try new things. Treatwell's main goal is to make booking beauty, styling and wellness appointments simple, effortless and fast – and now you can achieve this for less with a Treatwell promo code. And they continue to do this every day through their incredible online services. It’s beauty to the people, no matter what you choose. We are constantly on the hunt for first order Voucher Codes for Treatwell to help you with your money saving. Our experts check dozens of sites for secret codes including NHS discounts, student sites & social media channels saving you time & money!